Boston-bandet Swinging Steaks har holdt det gående siden slutten av 80-tallet og har en rekke album på CVen. I diise dager kommer nye »Sunday Best« (First National Records). A five-man band out of Boston,MA, Swinging Steaks are among the originators of the current roots rock/ alt.country movement. Fueled by dual singer/songwriters Jamie Walker and Tim Giovanniello, the group's material explores a rich diversity of musical Americana from full tilt rockers to mandolin-driven melodies and soulful ballads. with two top ten AAA / Americana radio singles and appearances on NBC-TV's »Late Night with Conan O'Brien« and NPR's »Mountain Stage«. Their four self-released albums, »Suicide at the Wishing Well«, »Shiner« the live, acoustic »Bare«, and »KickSnareHat« continued to expose the group to new audiences and garner them appearances at SXSW, CMJ Music Marathon and Nashville Extravaganza. After parting with Capricorn (who had moved in a different direction, signing more »alternative« bands such as 311 and Cake) they declined offers from from other major labels, and released »Shiner«, »Bare« and »Kicksnarehat« on their own Thrust Records. The band has appeared with / toured with John Fogerty, Los Lobos, Warren Zevon, Poco, the Black Crowes, Paul Westerberg, The Band and many, many others. Somewhere between The Band and Wilco, The Byrds and Jayhawks, falls the timeless alt/country sound of Boston's Swinging Steaks. They've been around for more than 15 years but this is their first nationally released set since 1993, as they've spent much of the past decade issuing albums on their own Thrust Records. Some will be discovering these guys for the first time. Others will feel like they're catching up with a long lost friend. No matter how you find them, find Swinging Steaks and »Sunday's Best.« In that genre known as »Americana« this is one of the best of the year. 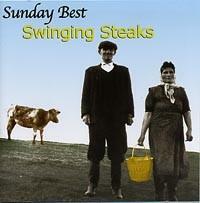 The Swinging Steaks swing back into action with the typically terrific »Sunday Best,« their sixth album. Chock full of finger-picking-good guitar, banjo, pedal steel and fiddle licks, keening harmony vocals and lyrics that are comic and thoughtful, the Steaks prove yet again that they are among the best purveyors of real country and roots (rock) ..."